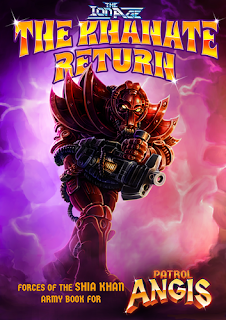 The Ion Age Blog: Khanate Return book and bundles released in print and as downloads! Khanate Return book and bundles released in print and as downloads! "A matter gateway is active on Camarthen IV. Losses are mounting, send everything; everyone. Send them now. The Khanate have returned." We are delighted to announce the general release of the third book in the Patrol Angis series. In print and as a digital download IAB03 The Khanate Return adds the first army book and the first alien race to the Prydian Precinct. For use with Patrol Angis and also Callsign Taranis. To see all the books back in stock and the bundles with saving go HERE or read on for more information. Get yours now! As with all of our print books the digital download versions can be downloaded immediately upon purchase and are twenty percent less in price than the print book version. 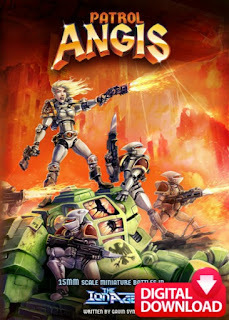 The third book in the Patrol Angis series is a new setting and forces title with statistics and rules for use with 15mm miniatures and models from theionage.com. This Army Book brings you to the Camarthen star system for a desperate campaign for possession of a planet upon which sits an alien Matter Gateway. Now that it is switched on the gateway has brought a mythical enemy of Humanity back to reality from far across the galaxy; The Shia Khan Empire. Making use of the Patrol Angis rule book for skirmishes and the Callsign Taranis expansion book for larger games you can now add the Khanate Empire and also Planetary Defence Forces to your games. Read all about the tragic fate of Camarthen Prime and the start of the second Khanate War as a world burns. You can then create and assemble your own Tesserans and Ordos (platoons) along with vehicles and more for the Khanate with armoury and army lists. Then consult army lists for the Planetary Militias to do the same with Troop Types, Armour, Weapons and platoon composition guides. There are also advanced rules for both new armies covering Nebula Charges, Humascare,and Robotic Infantry among other skills and equipment. The book ends with three small scenarios of varying complexity for new and experienced players. 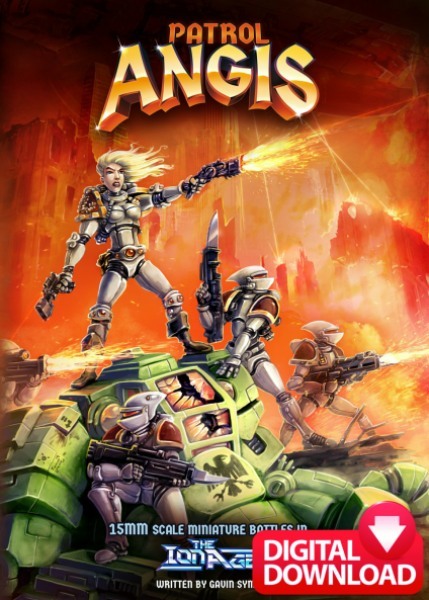 This Army Book joins up with other titles expanding the forces and the universe of The Ion Age. Put forces from a half dozen miniatures to more than a hundred including vehicles into play. Fight for victory on Camarthen Prime or take your fight elsewhere in the Prydian Precinct. YOU REQUIRE PATROL ANGIS AND CALLSIGN TARANIS TO MAKE USE OF THIS BOOK. Go HERE for print or for digital download through our website. 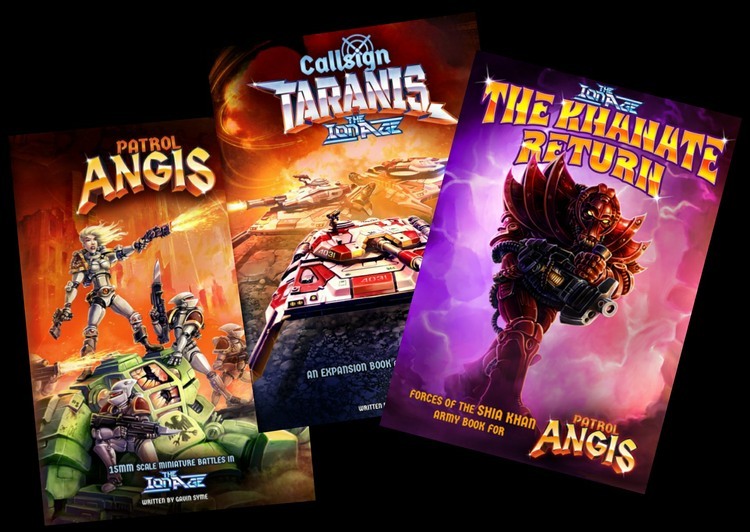 Get Patrol Angis and its expansion Callsign Taranis as well as the new army book The Khanate Return together! All the books in one bundle. You save ten percent off the print book prices or get the trio bundle as digital downloads in one purchase with twenty percent off by going HERE. We want you to try out the fast and lethal with lots of fun one hour play system that is Patrol Angis. From small skirmish to bigger battles in 15mm scale using your Ion Age miniatures and vehicles. There are free resources as well as reviews which you can download or have a look at. The links for these are on the website HERE. Enjoy! There is a folder of free resources for Patrol Angis. Download it! The Xin Trade Fleet in Patrol Angis. Get the free PDF. The Prang Raiders in Patrol Angis. A free PDF. Reviews and AAR's of Patrol Angis. A video play though of Patrol Angis by Dorkside Cookies. Visit 'Conflict Cornucopia' blog. 'Beightons Shipyard'. After Action Report (AAR) by Conflict Cornucopia blog. Note these show the older cover of Patrol Angis but it is the same book. 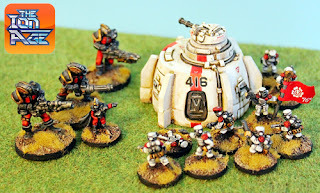 A Patrol Angis AAR by Rod Forehand on our blog. An in depth review of Patrol Angis by Just Play February 2017. You can assemble a whole Legion's worth of infantry for the Shia Khan Empire using the 15mm range now from Legionaries to Pioneers as well as Nox and Maligs. While almost all Legionaries have their helmets on there are both male and female aliens in the Legion so this month we give you a useful miniature to add to any Tesseran or Ordos. IMP45 Female Khanate Legionary. Free in every order every time all month before being retired. This miniature is automatically put into every order at the rate of one per order regardless of order value. It can also be bought in any amount on the monthly IMP page of the website for this month only too before being withdrawn on the first of next month. Standing 17mm to the eye line our female Legionary is tall like all elvish Legionaries. Bare headed, helmet under her arm and sporting a Maia Mpi she is useful in any Khanate force. This miniature is worth 0.60GBP. Lastly we have a new month long special offer...to go with your super heavy lads for the Shia Khan we have 25% off IAF039 Khanate Warlords both the pack and the single miniatures from it. The discount is online and all you need do is add to cart, reward points are as normal and can be used on this offer too. Offer ends 1st June. Click on the link to learn more.